A series of optically transparent and colorless polyimide (CPI) coatings for quartz optical fibers (QOFs) protection were prepared by the copolymerization of two aromatic dianhydrides, 3,3′,4,4′-biphenyltetracarboxylic acid dianhydride (BPDA) and 2,2′-bis(3,4-dicarboxyphenyl)hexafluoropropane dianhydride (6FDA), and 2,2′-bis(trifluoromethyl)benzidine (TFMB) by a two-step polymerization procedure via the soluble poly(amic acid) (PAA) precursors followed by thermal imidization at elevated temperatures. Various QOFs with the flexible and tough CPI coatings were successfully fabricated. Scanning electron microscopy measurements revealed that the CPI coatings tightly adhered to the quartz optical fibers without adding any adhesion promoters. The CPI coatings exhibited good optical transparency with the transmittance higher than 83% at 450 nm at a thickness of 10 μm, high lightness (L* > 93), low yellow indices (b* as low as 2.66), and low turbidity (haze as low as 0.57%). 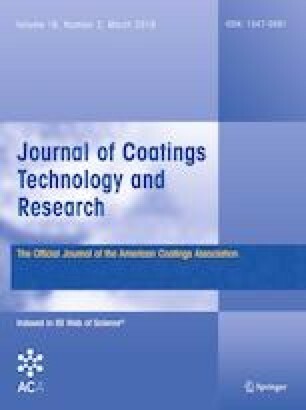 In addition, the CPI coatings exhibited good thermal and dimensional stability with glass transition temperatures (Tg) higher than 349°C and coefficients of linear thermal expansion (CTE) as low as 6.8 × 10−6/K in the range of 50–300°C. Financial support from the Fundamental Research Funds of China University of Geosciences (No. 2652017345) is gratefully acknowledged.